Autism BrainNet (and its predecessor the Autism Tissue Program) is an organization that promotes research into the causes of autism spectrum disorder (ASD) by facilitating studies of the postmortem brain. Since the start of this effort in 1998, the field of autism research has made hundreds of important advances. But some of the larger contributions to the understanding of the causes and therapies for autism could not have been made without the resource of human postmortem brain tissue. The following are just some of the major advances in autism research that are made possible through human brain tissue research. 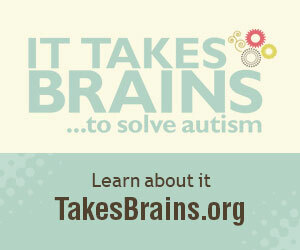 You can help make research happen by registering with the Autism BrainNet at www.takesbrains.org. Some early findings in studying the brains of people with autism pointed to an abnormal organization of cortical minicolumns.1 These are the primary “central processing units” of the cerebral cortex. Several laboratories have found that minicolumns in people with autism are narrower. This suggests that there are fewer connections across the layers of the neocortex which may impair information processing. Researchers are using postmortem brain tissue and advanced technology to study the layers of cortex and the interaction between different cortical regions.2 Collectively, this research has shown that abnormal interactions between brain cells and brain regions, may be an important factor for autism symptomatology. Most scientists agree that ASD is caused by a combination of both genetic and environmental factors. While hundreds of candidate genes have been discovered, only a few environmental risk factors have been demonstrated. Using brain tissue, researchers were able to demonstrate that both are critically important. For example, work at UC Davis showed that the levels of PCBs, or polychlorinated biphenyls, a man-made toxic substance found throughout our environment, was higher in brains of individuals with autism.3 There was a catch though – this elevation was seen mainly in a subgroup of individuals with a known genetic mutation. Thus, the reality may be that both genetic modifications as well as environmental factors must combine in many cases to cause ASD. Since environmental toxins may be particularly dangerous to brain development, it will be increasingly important to study the interactions between multiple environmental factors and genetics on the human brain. One mechanism by which genes and the environment may interact is called epigenetic modification. In addition to the DNA sequence, our DNA has a code called the ‘epigenetic’ code, that turns on or turns off DNA expression. This system explains why identical twins may be so different – environmental factors may be turning on DNA expression under certain conditions. The epigenetic code was studied in the brains of individuals with autism, and researchers at the Johns Hopkins School of Public Health found places in the genome where the DNA may have been turned on or turned off at the wrong times in people with ASD.4 Importantly, because the epigenetic markers to DNA can be different in blood vs. brain, alterations of epigenetic markers in brain tissue may be closest to the real pathology of ASD. Because epigenetics is sensitive to environmental factors, this potentially opens up new avenues of prevention and treatment. Without human brain tissue to study, it would be far more difficult to develop animal and cellular model systems. For example, one of the first model systems of ASD was the valproic acid model.5 It was established because individuals with autism show specific changes in a cell type called Purkinje cells in the cerebellum.6,7 Similar changes in Purkinje cells are seen in rats exposed to valproic acid during gestation. In addition to the valproic acid model, other models have been born out of brain tissue research. For example, people with autism have more dendritic spines, where connections with other neurons are formed.8 Recently, a similar finding was reported in monkeys who were exposed to a profound immune activation during gestation.9 Because maternal immune activation is a possibly preventable risk factor, a better understanding of interventions that can prevent some of these anatomical changes is made possible through use of model systems. Parents of a child with autism need to know what to expect as their children age. 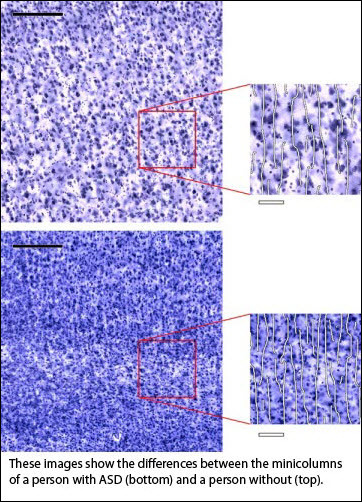 Results from brain tissue are able to document changes on a cellular level in different age groups. The volume of neurons changes as a person ages. In a child with autism, some investigators have found that the volume of neurons is smaller than that of a child who does not have autism. But over time, they tend to get bigger than those without ASD.10 The number of dendritic “spines” is also a marker of how the brain ages. In people with and without autism, you have more of these spines when you are young compared to when you are older. This may indicate the ability of the brain to solidify brain connections that are important, and reduce those that become unnecessary. Scientists call this “pruning” – like pruning a tree. People with autism have more dendritic spines, and this pruning process is not as pronounced.11 This may indicate that the brains ability to mold and adapt is reduced. Developing strategies for normalizing the pruning process may be a potential therapeutic for ASD. By creating test conditions in animals that are similar to those in humans, scientists have investigated the structural changes that can be altered with treatments. As mentioned earlier, the number of dendritic spines, which form the synapses, or connections between neurons, is increased in individuals with autism, an effect that is seen throughout life. These findings have prompted researchers to examine compounds which target the synapse. Looking deeper into the synapse of people with autism, compounds which are being studied for the treatment of Fragile X disorder 12 and Tuberous Sclerosis11 may also be effective in reversing abnormal spine organization and the symptoms of ASD. This is only the start. Scientists agree that discoveries about the causes, diagnosis and treatment of ASD are slowed because there is not enough brain tissue to study. There are powerful scientific tools that are ready to be used for explaining the mysteries of the autistic brain. There is not a shortage of willing and creative scientists, of money to carry out the research or of sophisticated and powerful technology. The only think that is holding back progress is the availability of postmortem brain tissue. Every family should consider registering with Autism BrainNet – registration is non-binding but expresses your interest in getting more information about the possibility of donating. Please do it now. Visit www.takesbrains.org and sign up. Casanova, M.F. (2007) The neuropathology of autism. Brain Pathology. 17(4),422-433. Abstract. Stoner, R., Chow, M.L., Boyle, M.P., Sunkin, S.M., Mouton, P.R., Roy, S., Wynshaw-Boris, A., Colamarino, S.A., Lein, E.S., Courchesne, E. (2014) Patches of disorganization in the neocortex of children with autism. New England Journal of Medicine, 370(13), 1209-1219. Abstract. Mitchell, M.M., Woods, R., Chi, L.H., Schmidt, R.J., Pessah, I.N., Kostyniak, P.J., LaSalle, J.M. (2012) Levels of select PCB and PBDE congeners in human postmortem brain reveal possible environmental involvement in 15q11-q13 duplication autism spectrum disorder. Environmental and molecular mutagenesis, 53(8),589-598. Abstract. Ladd-Acosta, C,, Hansen, K.D., Briem, E., Fallin, M.D., Kaufmann, W.E., Feinberg, A.P. (2014) Common DNA methylation alterations in multiple brain regions in autism. Molecular Psychiatry, 19(8),862-871. Abstract. Ingram, J.L., Peckham, S.M., Tisdale, B., Rodier, P.M. (2000), Prenatal exposure of rats to valproic acid reproduces the cerebellar anomalies associated with autism. Neurotoxicology and Teratology, 22(3),319-324. Abstract. Bailey, A., Luthert, P., Dean, A., Harding, B., Janota, I., Montgomery, M., Rutter, M., Lantos, P. (1998) A clinicopathological study of autism. Brain. 121(Pt 5),889-905. Article. Hutsler, J.J., Zhang, H. (2010) Increased dendritic spine densities on cortical projection neurons in autism spectrum disorders. Brain Research,1309,83-94. Abstract. Weir, R.K., Forghany, R., Smith, S.E., Patterson, P.H., McAllister, A.K., Schumann, C.M., Bauman, M.D. (2015) Preliminary evidence of neuropathology in nonhuman primates prenatally exposed to maternal immune activation. Brain, Behavior, and Immunity, 48, 139-46. Abstract. Wegiel, J., Flory, M., Kuchna, I., Nowicki, K., Ma, S.Y., Imaki, H., Cohen, I.L., London, E., Brown, W.T., Wisniewski, T. (2014) Brain-region-specific alterations of the trajectories of neuronal volume growth throughout the lifespan in autism. Acta neuropathologica communications. 2,28. Abstract. Tang, G., Gudsnuk, K., Kuo, S.H., Cotrina, M,L., Rosoklija, G., Sosunov, A., Sonders, M.S., Kanter, E., Castagna, C., Yamamoto, A., Yue, Z., Arancio, O., Peterson, B.S., Champagne, F., Dwork, A.J., Goldman, J., Sulzer, D. (2014) Loss of mTOR-dependent macroautophagy causes autistic-like synaptic pruning deficits. Neuron,83(5),1131-1143. Abstract. Fatemi, S.H., Folsom, T.D. (2014) GABA receptor subunit distribution and FMRP-mGluR5 signaling abnormalities in the cerebellum of subjects with schizophrenia, mood disorders, and autism. Schizophrenia Research, S0920-9964(14)00549-0. Abstract. 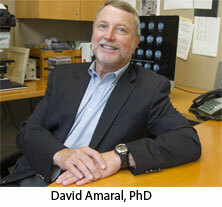 Photo credits: Photos of Alycia Halladay, PhD and David Amaral, PhD courtesy of the authors. Image of minicolumns courtesy of Manuel Casanova, MD. 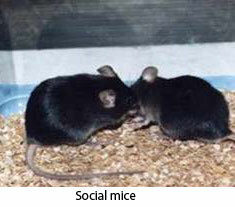 Photo of social mice courtesy of Jill Silverman, PhD.